they seem to come in all shapes and sizes. . . .
Sound like anyone you know? These are just a few of the more prominent types of difficult people at work. 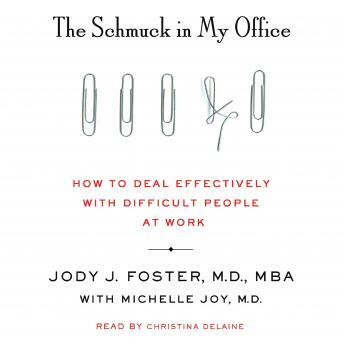 In The Schmuck in My Office, Dr. Jody Foster explains the entire spectrum of people we may think of as schmucks, how they can decrease productivity, destroy teams, and generally make everyone else unhappy. Along with nailing down the various types, she looks at personality traits and explains how dysfunctional interactions among coworkers can lead to workplace fiascos. She helps readers understand schmucks as people, figure out how to work with them, and ultimately solve workplace problems. She also makes readers consider the most difficult thing of all: despite where your finger may be pointing, sometimes you are the "schmuck"! Let Dr. Foster teach you how to make your workplace a happier and more productive one.